Here’s Rosso Fiorentino in full flight. The contorted bodies and white-knuckle emotions are the mannerist style in full perversity and glory. 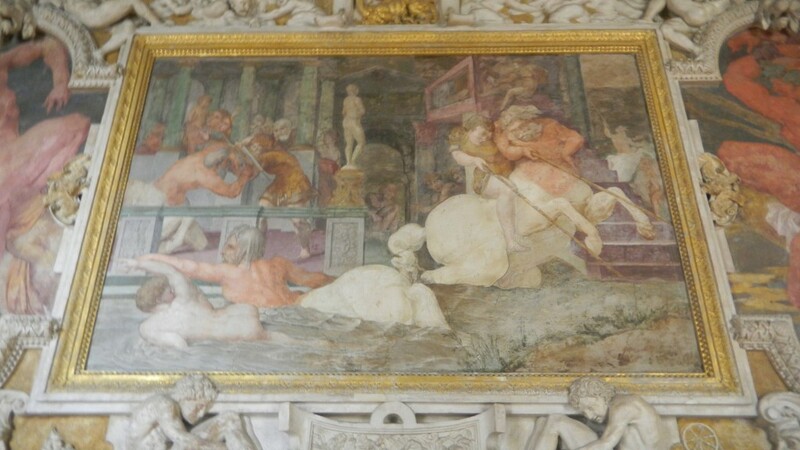 This fresco of the death of Adonis is only one of many paintings that line the long gallery in Francois I’s favorite chateau, Fontainebleau. The gallery’s diverse collection of art works had a lot of impact on French culture, and the modern West. Some modern scholars claimed to finally understand the paintings’ complex symbolism. Many paintings are of death and misfortune. They might have symbolized the dangers of letting your passions run amok. 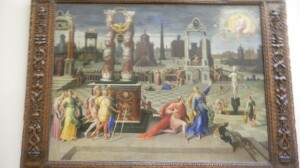 But the above painting is about the education of Achilles. The best fighter from ancient Greece’s earliest written epic story, the Iliad, is learning fencing, swimming, lance-throwing, music and hunting. This scene might illustrate the importance of getting the best education. The art historian Erwin Panofsky saw a pattern in these paintings. The death and destruction stuff is more concentrated towards the end of the hall by the royal apartments. Scenes that show the universe in order, like The Royal Elephant, are more numerous near the chapel’s end. Francois might have felt a spiritual transformation as he walked from his living quarters to the chapel. That’s pretty in theory. But in reality he instigated wars that exhausted France’s finances, and he bedded more women than Mick Jagger. But many French people adored him over the ages because he represented glory. 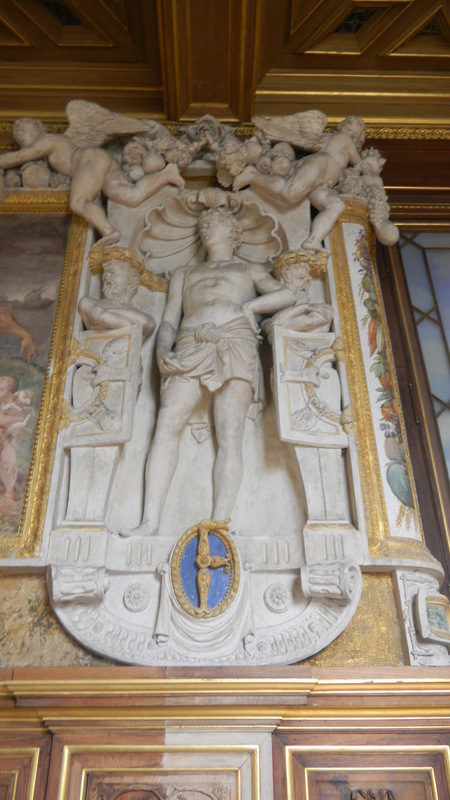 And though he was a bad student of his own art, it did some glorious things for France and Western Civ. 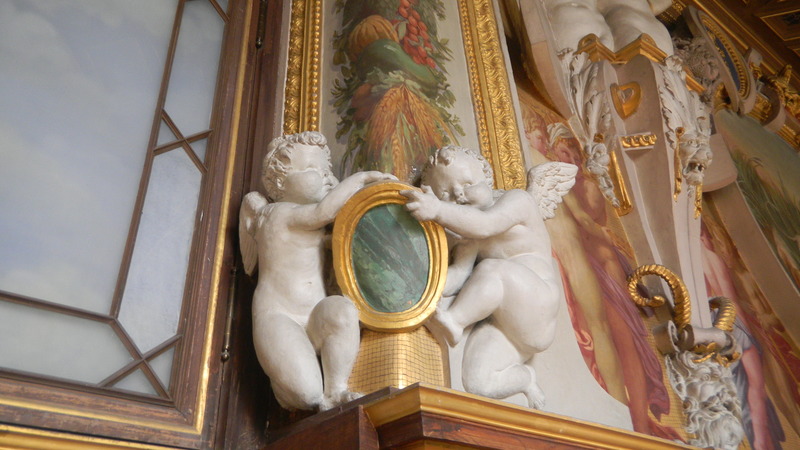 to little cherubs (sculptures of cute babies in their birthday suits were fashionable in ancient Rome). 1. The spreading of the classical tradition to the north. 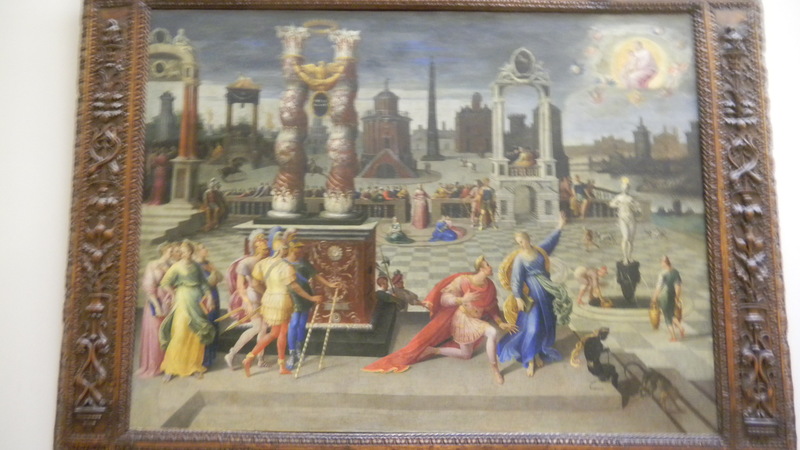 Realistic art, linear perspectives and themes from ancient Greek myths added greatly to northern Europe’s horizons. Plays from the 16th century had many more characters and settings than ancient Greek drama did. Northern Europe’s horizons were opening up. Artists in Rosso’s wake developed the Fontainebleau School. They used dramatic colors, but in soft and playful ways. They went for grace more than intensity. You can even see whimsical colors in the ancient Roman scene above. French joie de vivre didn’t come from Italy–it was in full glory in High Gothic Style. But it got a huge burst of energy when Francois imported the Italian Rensaissance’s expressions of both rationality and fancy at the same time. French culture favored both in different times–the former during Louis XIV’s reign at Versailles, and the latter in modern art. Francois spread the West’s emphasis on realistic art and abstract lines and shapes, and gave it more strength. But he also added whimsy. France’s ability to balance both, and alternate between them in different times has made it a bottomless well of art and ideas. Francois’ elephant-sized male ego helped create La Belle France, and Western culture is much richer for it.